The following highlights are from projects where I was the primary researcher. For a complete list of publications please see my Google Scholar or Researcher ID profiles. Some of the descriptions below are written to be more accessible to non-specialists. If you have questions or want to better understand my work please contact me. The "Learn More" links below link to publications. If you would like a copy of the paper or more information please contact me. We used isotope tracers 87Sr/86Sr and δ18O with a reactive transport model to calculate the fracture spacing in the Long Valley geothermal system. Understanding fracture spacing helps to constrain the heat exchange properties of the resevoir. We are working to develop the radon isotope 222Rn in geothermal fluids as a tracer of fracture surface properties such as surface area and aperture. The short half life of 222Rn means that only near fracture 222Rn is sampled by fracture fluids. The amount of 222Rn in the fluid is controlled by the rock uranium concentration, and the surface area:aperture ratio (at steady-state). An early interest of mine was the source components and processes that produce island arc lavas. These lavas that occur above subduction zones are of interest because they are compositionally similar to the Earth's continental crust and may help us understand how the crust was originally formed and evolved over the last ~4 billion years. We studied the Hf and Nd in lavas from the Aleutian arc, in part to determine whether the recycled sediment component contained hafnium. We additionally observed that the Hf and Nd isotopic systems are decoupled from one another in the eastern Aleutians, which could be due to a changing sediment component or the subduction (and melting) of isotopically distinct seamounts. Roll fronts are sedimentary deposits of economic grade uranium (U) ore. They are thought to form where ground water with dissolved oxygen and U crosses a boundary where the U is precipitated due to the removal/consumption of the oxygen. Roll fronts are typically 10's of meters wide and are typically 0.1-1.0% U by weight. There are a lot of remaining questions about the stability of the roll fronts over geologic time and when they are disturbed by human mining activities. The primary source of uranium (U) ore in the USA is in situ leaching of low grade ore deposits hoasted in aluvial sands and sandstones. There are several environmental advantages to this technique but there are concerns about downgradient U migration after mining and restoration are completed. 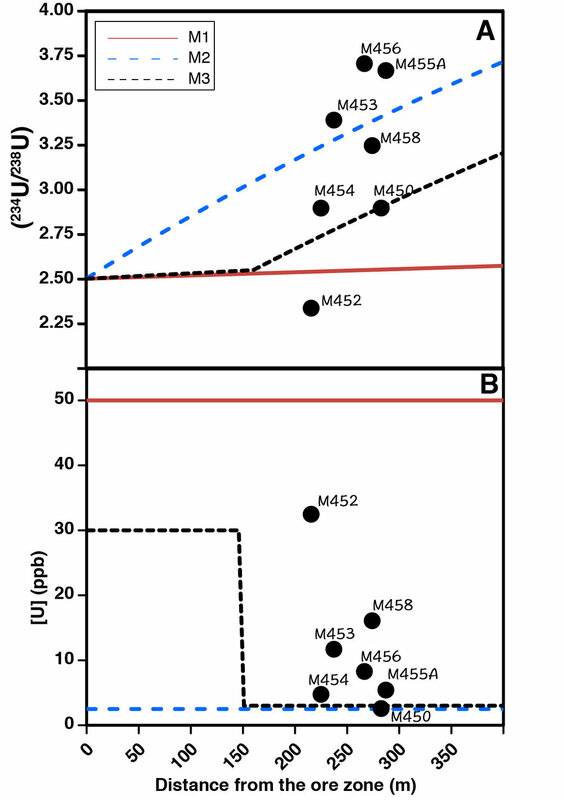 We looked at natural variations in the isotope ratio 234U/238U to calculate the distance that high U concentrations migrate downgradient before most U is precipitated as U(IV) minerals. We conclude that most U is removed between 0 and 150 meters of the ore zone. There are followup studies underway that explore other minerals in both natural samples and hydrothermal experiments. I am currently working on a project to understand the mechanisms that lead to variable isotope fractionation during redox reactions. One example system is the transformation of oxidized, dissolved uranium (U(VI)) to reduced U(IV) at environmental conditions. 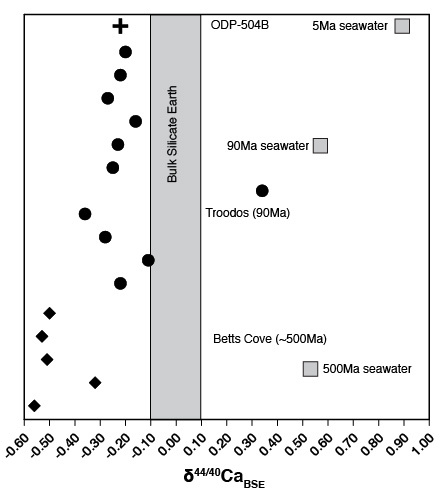 There are now many observations of variable 238U/235U in rocks, sediments and various waters globally. From these data many researchers have inferred isotopic fractionation factors that vary from no fractionation ~1.0000 to ~1.0010 or 1‰. As part of a larger collaboration I am conducting experiments to understand why there are apparent variations in the fractionation factor. Stay tuned we have interesting results that will be presented soon. This work is primarily in collaboration with Anirban Basu (Royal Holloway). The black smoker "Sully" in the Endeavor field. Image courtesy of NOAA (public domain). Mid ocean hydrothermal systems are an important part of element and heat exchange between the Earth's interior and surface. These systems are most well known from the discovery of black smokers (pictured) where very hot water (>300˚C) rich in dissolved metals erupts on the sea floor. While the black smokers are striking geologic features the lower temperature, long term alteration of the ocean crust is likely to have a greater effect on the chemical composition of seawater. One reason we are interested in ocean crust alteration is to understand the uptake and storage of carbon over geologic timescales. As the concentration of carbon dioxide increases in the atmosphere it also increases in the ocean, where it can be converted to carbonate minerals such as calcite by organisms (e.g. coral and clams) or inorganically in the seafloor. Presently we have a limited understanding of how much carbon can be stored in the ocean crust and how varying factors influence the ultimate storage capacity. I am studying the storage of carbon in the ocean crust by examining the shifts in the isotopic compositions of Ca and Sr in variably altered ocean crust.